How Does a Numerology Reading Work? What Information Can a Numerology Reading Reveal? My Top 5 Favorite Numerology Reading Websites- Which Is Most Authentic? If you're like most people, you're probably searching for answers to help make sense of the chaos called life—whether it's answers relating to love and career choices or simply trying to find a way to better understand your purpose and place in the world. In this sense, a numerology reading can be a huge help by revealing details describing your personality and your life in general, including your past, present and future. In truth, numerology is actually quite a complex science and one that the average person usually knows very little, if anything about. For this reason, it's important to look into it in greater detail in order to give you a better idea of what a numerology reading is and what it can tell you about your life, the universe and everything in general. Numerology is often referred to as the language or science of numbers even if this definition is a bit simplistic and doesn't really describe the discipline in full. In essence, numerology seeks to break down the universe into patterns of numbers and then studies what these numbers reveal about certain character traits and skills. In numerology, every letter corresponds to a different number, and each number has its own related cosmic vibration. It is through studying the interrelation between these cosmic vibrations that numerologists are able to reveal information about your character, your cosmic past and potentially what the future may hold. A numerology reading takes into account your full name given to you at birth, the name you currently go by and your birth date in order to reveal details about your life. Although various parts of a numerology reading take different numbers into account, both the sum of the numbers in your birth date and the value derived from the numbers corresponding to the letters in your name are of great importance. These numbers form the basis of your personal numerology chart, which can be used to divine a wide range of information. This chart contains many different numbers, each of which plays a role in determining all of your personal traits and the various phases of your life. Your full given name is incredibly important, as the corresponding numbers represent all the tools and skills given to you to use throughout your life. This includes not only not only your talents, abilities and personal attributes, but also your weaknesses, shortcomings and even information about karmic challenges you must face due to actions in past lives. When divining the numerological value of your name, the corresponding numbers for each letter in your name are added up to get a total. The digits in this total are then added together to give you a final number that provides deep personal insight into your life. For instance, if the numbers in your name add up to equal 34, the numbers three and four are then added together to reveal the final number—in this case, seven. Still, it's not just the total numerical value of your name that's important. Each of the letters in your name and the order in which they appear can also reveal various things about your life and character. If you now go by a different name than your birth name, this value is also taken into account. This is true no matter whether you are married and no longer use your maiden name, go by a nickname or even just a shortened version of your full name, as how you introduce yourself and what people call you are also important. Analyzing all of these numbers and where they appear in your numerological chart provides a numerologist with much useful info about your life's path, hidden desires and passions, future trends and challenges you'll face along the way. Although all numbers in the chart are significant in some way, certain numbers are more revealing than others. For instance, one of the most important is your Life Path number, which provides information about the path you're traveling along. Also important is your Personality number, as this describes the way you approach life and also how others perceive you. The Expression number contains details about your life goals and desires, while your Birth Day number reveals insights about the specific talents you possess. Other important numbers include the Balance number, which can be used as a guide showing how you should conduct yourself when faced with adversity, and the Heart's Desire number, which shows your secret inner goals and dreams. As well, the Maturity number can show how self-aware you are, while the Challenge numbers provide clues about the various obstacles you'll face on your path. Your chart also reveals information about your various life cycles or phases, which help to show what may be in store for you at different times in your life. Similarly, just as you have your own personal numerological chart and personal cycles, there is also a universal numerological chart and universal cycles that can help provide details about the future of the world. Furthermore, the interplay between your personal cycles and the universal cycles can provide even more details about what lies in store for your future. According to numerology, your ideal name is the one very first given to you, and we're not talking about the one given to you as you were born into this life. In fact, there are many cases where a person's current name actually presents them with a range of unnecessary challenges. Alternatively, it could be that your current name simply doesn't accurately fit with or describe your personality. In both cases, numerology can be used to help determine what your ideal name should be or to find a name that helps provide you with more power to give you a better chance of succeeding on your path. As you can see, all of your various numbers contain valuable information that can give you a deeper insight into your past, present and future. Still, the aforementioned numbers are really only the tip of the iceberg in terms of things numerology can reveal. In fact, the only real way to understand just how valuable numerology can be is to have a reading done. In all likelihood, you'll be shocked by just how accurate it is and how much your chart has to say about your life. Over the years, I have had my fair share of psychic readings from many online psychic websites. From those readings and experiences, I have decided upon these six psychic networks that I believe offer the best numerology readings. These are ranked starting with my favorite listed first. With so many different psychic sites to choose from for a numerology reading, which is the best? For over twenty years, AskNow has been offering professional and accurate numerology readings with over a million satisfied customers. To ensure accuracy, all of the psychics at Ask Now have to pass a rigorous screening process. When you get a reading from one of their psychics, you can rest assured knowing all of the psychics are genuine and real. My favorite psychic for a numerology reading at Ask Now is Psychic Intuitive Amy. I generally prefer angel card readings, but on the occasion I want a numerology reading, I always go with Amy at Ask Now (she is one of their highest rated psychics). Ask Now Psychics backs all numerology readings online with a satisfaction guarantee. Prices start at $1 per minute. You can buy a 15 minute reading for $10 and get an additional three minutes free. Psychic Source is my second favorite psychic site to get a numerology reading for relationships. Psychic Source offers psychic readings on every platform imaginable. 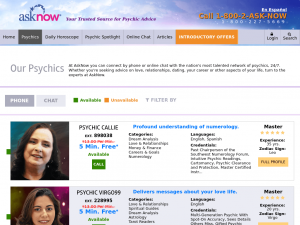 From either their website or via their mobile app, Psychic Source offers genuine relationship numerology readings over the phone, over a live chat, through their video conferencing technology or via their mobile app. 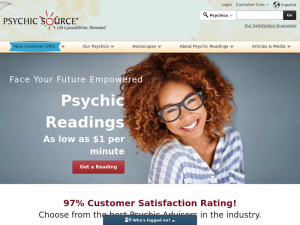 Psychic Source has very reasonable rates. 30 minute blocks can be purchased for less than $20 and you are always in control of your account balance. A satisfaction guarantee ensures you are totally satisfied with your numerology reading from Psychic Source. Give them a try! Third runner up is Kasamba Psychics. With over three million satisfied customers, Kasamba is a strong contender for my favorite site to get a accurate online numerology reading. 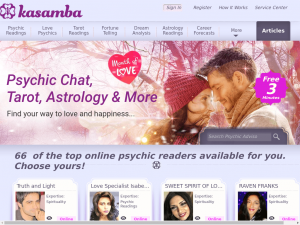 Kasamba makes it is super simple to quickly find a real psychic specializing in numerology. More often than not, there are dozens of numerology readers available 24/7 to give you a reading. Even better, Kasamba offers personal numerology readings through various platforms. This includes telephone, online chat, mobile app, via video conferencing or even e-mail. If you sign up with Kasamba today, you can get three minutes free as well as 50% off your first numerology reading online. Prices start at $1/min. If you are unhappy with your reading, contact Kasamba for a full refund. Simple! Oranum Psychics is widely known as the largest spiritual community on the internet. Unlike other psychic sites, Oranum only offers numerology chart readings exclusively via their browser-based video conferencing platform (no special software needs to be installed). This allows you to see your psychic in real time, face to face during your reading. The sheer amount of psychics on Oranum is impressive. At any given moment, there are hundreds of live psychics available for you to choose from. There has never been a time where I was not able to get a full numerology chart reading when I needed one. Oranum does not screen their psychics as strictly as other sites.. 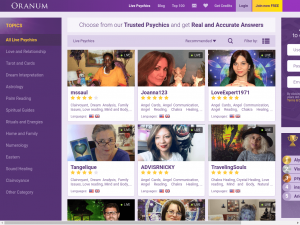 Instead, you can view customer reviews and ratings of each psychic. There is a running ‘top 100 psychics' list where you can quickly see who gives the best numerology chart readings. Prices start at $1 per minute. If you sign up today, you can get 10 minutes completely free with your purchase. Hollywood Psychics is a newcomer (being in business for less than a decade) but they have built a reputation on offering authentic numerology readings. Hollywood Psychics offers these readings via e-mail, phone, or live chat. Unlike other psychic sites on my list, Hollywood Psychics is unique in that it gives psychic readings over email for free! That's right, you can choose any psychic and get a free e-mail based numerology reading with a psychic of your choice. You will only need to supply a few pieces of information and the psychic will e-mail you back a response. Similar to other psychic networks, Hollywood Psychics takes pride in only hiring the most talented psychic advisors. This means that every psychic goes through a strict screening process. No fakes here. More than 90% of the psychics are turned away. 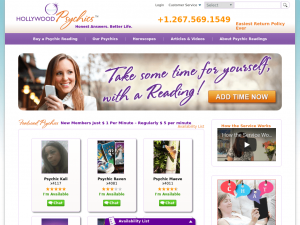 It is worth noting that Hollywood Psychics is the cheapest psychic network on this list. With prices starting at $.50, it is hard to beat. They also promote a 100% satisfaction guarantee. If you are not happy with a psychic or a reading, you can get a full refund with no questions asked. What Is A Numerology Reading? What Are Psychic Rune Readings?